Atari's swansong, the Jaguar was designed to be the first of the new generation following the golden age of the 16-bit consoles ruled by the SNES and MegaDrive. 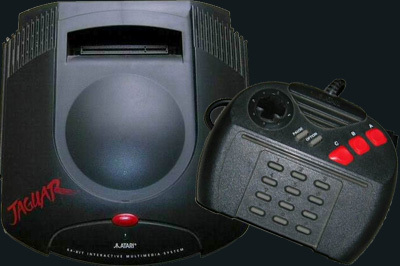 The Jaguar was released in 1993 and marketed as not a 32-bit but a 64-bit console, unfortunately it was this very feature that made the console so stupidly hard to develop for. Developers found that the amount of effort required of them was not matched in terms of quality of end product. Two year's later the Playstation arrived and finished it and Atari off. Project Tempest - Originally designed just to run Tempest 2000, Project Tempest has become a very capable Jaguar emulator. Atari.org - ...and everything else!